When Lynn Hill became the first person to free the Nose in September 1993, she was 32 years old and one of the best-known climbers of her generation. Tommy Caldwell and Rodden were also big-name climbers when they freed the route, in 2005. Connor, on the other hand, has only just landed on the scene, turning heads with hard climbs inside and out after a youth spent learning the ropes. Connor was weaned on Valley granite from an early age, scurrying up routes on Half Dome, and climbing the Nose in a day for the first time at just 13 years old. Most of his Valley apprenticeship has been with with his parents, Jim Herson and Anne Smith, accomplished climbers themselves. In 2003, with Hans Florine, Jim made the eighth free ascent (after years of work) of the Salathé Wall (VI 5.13b)—90 hours after which Connor was born! Working toward a free ascent of the Nose has been one of Connor’s main projects over the past year. Supported by his father, Connor made his first proper redpoint attempt on the route for the first time last week. He very nearly finished it off on that first try, redpointing the Great Roof (5.13d) on just his second burn and falling with just a foot left of hard climbing on the Changing Corners (5.14a) pitch. It was his first time ever leading either of those crux pitches. See below for two videos of Connor on those pitches during that first attempt. While you might assume all Connor’s time spent on techy granite comes at the expense of hard sport climbing, you would be ever so wrong. He sent 14 5.14s when he was 14 years old, including a wildly impressive second-go ascent of Southern Smoke (5.14c), the Red River Gorge, Kentucky. Some of his other 5.14 ticks include Lucifer (5.14c), also in the Red; Galactic Emperor (5.14a), Ten Sleep, Wyoming; and a 5.14b (T-Rex, Maple Canyon, Utah). Competition climbing is very much in the kid’s wheelhouse, too. 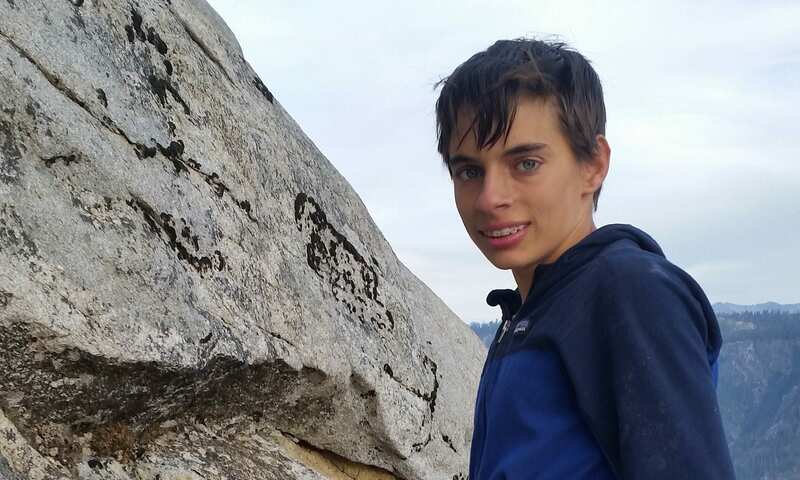 In 2018, Connor was the male Youth B gold medalist at USA Climbing’s Youth National Championships, improving on his none-too-shabby silver from 2017. He has competed on the international stage as well, finishing 11th in sport climbing and 33rd in bouldering at the 2018 IFSC Youth World Championships in Moscow. The past few days enter Nose lore as some of the most exciting in the route’s history. Just yesterday, November 18, the Japanese climber Keita Kurakami completed the first ever all-free rope-solo ascent of the Nose (his was the fifth free ascent of the route). And, as far as we know, Nina Caprez is still toiling away trying to sneak in a free ascent of her own. Could this be the first season ever to see free ascents by three different individuals?